Coffee is one of the most popular drinks in the U.S., which makes for a perky population—but it also creates a lot of used grounds. Scientists now report in the journal ACS Sustainable Chemistry & Engineering an innovative way to reduce this waste and help address another environmental problem. They have incorporated spent coffee grounds in a foam filter that can remove harmful lead and mercury from water. Restaurants, the beverage industry and people in their homes produce millions of tons of used coffee grounds every year worldwide, according to researcher Despina Fragouli. While much of the used grounds go to landfills, some of them are applied as fertilizer, used as a biodiesel source or mixed into animal feed. Scientists are also studying it as a possible material for water remediation. Experiments so far have shown that powder made from spent coffee grounds can rid water of heavy metal ions, which can cause health problems. But an additional step is needed to separate the powder from the purified water. Fragouli and colleagues wanted to simplify this process. 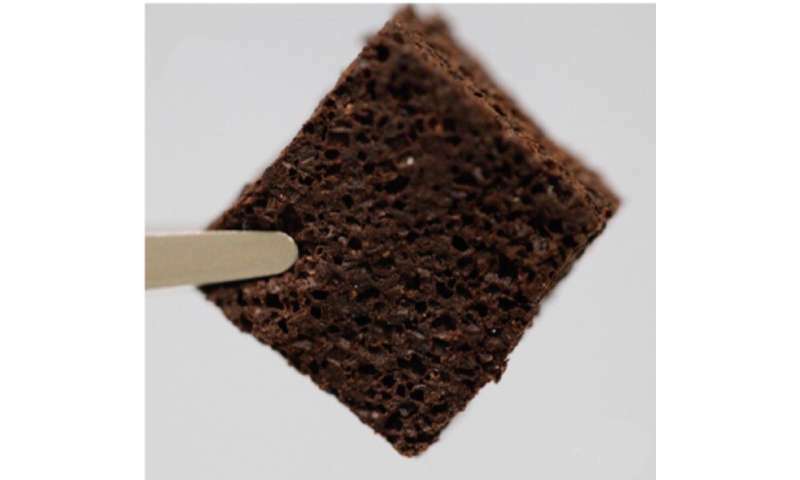 The researchers fixed spent coffee powder in a bioelastomeric foam, which acted as a filter. In still water, the foam removed up to 99 percent of lead and mercury ions from water over 30 hours. In a more practical test in which lead-contaminated water flowed through the foam, it scrubbed the water of up to 67 percent of the lead ions. Because the coffee is immobilized, it is easy to handle and discard after use without any additional steps, the researchers say. Herein we present an interesting approach for the reutilization of coffee waste in water remediation. This is achieved by the development of bioelastomeric foams composed of 60 wt % of spent coffee powder and 40 wt % of silicone elastomer using the sugar leaching technique. In this study, we present the necessary characteristics of the developed "green" foams for the successful removal of Pb2+ and Hg2+ ions from water, and we identify the involved mechanisms. The capability of the bioelastomeric foams to interact with Pb2+ and Hg2+ is not affected by the presence of other metal ions in water as tests in real wastewater demonstrate. The incorporation of the spent coffee powder in a solid porous support, without compromising its functionality, facilitates the handling and allows the accumulation of the pollutants into the foams enabling their safe disposal. The fabricated foams can be used for the continuous filtration and removal of metal ions from water, demonstrating their versatility, in contrast to the sole coffee powder utilized so far, opening the way for the reutilization and valorization of this particular waste. Could you run your car on coffee? Because the coffee is immobilized, it is easy to handle and discard after use without any additional steps, the researchers say. Of course then, the foam is full of lead and mercury so you can't just discard it. are there Lead molecules suspended in these waters which are NOT ionized? Is it a minority percentage?